Finding the next generation of safer hair dyes may be as simple as going to the library – in this case, NC State's Max Weaver Dye Library. 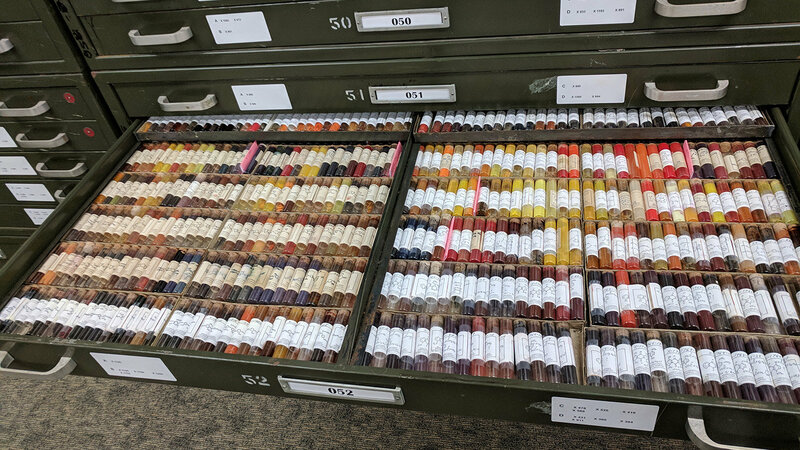 The dye library, donated by the Eastman Chemical Company, contains nearly 100,000 unique dyes waiting to be fashioned into the products of tomorrow. Researchers from NC State's College of Textiles and the Department of Chemistry searched the Max Weaver Dye Library for compounds with high chemical similarity to known reference hair dyes. Chemical similarity is a measurement of the number of shared structural properties between two compounds. The goal is to discover possible dyes that could be used in next-generation hair-color products that are safer for consumers, stylists and the environment. "We now have potentially a new subclass of dyes that hold promise for use in hair," says Tova Williams, a former NC State Ph.D. student and lead author of a journal article about the research. "One in particular has the potential to have a stronger bond with hair." Coloring hair is a multibillion-dollar global business that's growing rapidly. Hair dyes are divided into three basic types, depending on how long they last. Temporary dyes, which coat the hair surface, wash out with one or two shampoos. Semi-permanent dyes last a bit longer – through six to eight washings. About 80 percent of commercial hair dyes on the market, however, are permanent. When a permanent hair dye is applied, tiny precursor molecules slip inside the core of hair fibers, where they "join hands" to form larger molecules and impart color, Williams says. Permanent hair color resists washing out because it's physically entrapped inside the hair shaft through the chemical process of oxidation. "The goal is to use alternative precursors that are not toxic and that don't cause skin-sensitive allergies," Williams said. "By modifying the structure of key compounds in the dye library, we hope to design novel dye precursors that are environmentally safe, put them into hair and then transform them into colors to take advantage of the unique dye compound structures. "There's more work to be done, but this is a promising start," Williams said.